In April 2014, we formed our partnership with the Silverstein Institute. 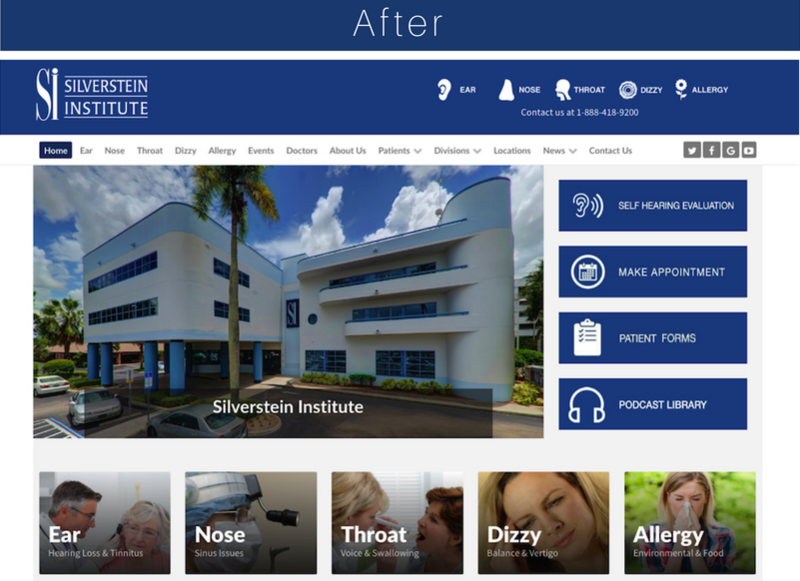 The Silverstein Institute provides innovative patient care for the treatment of Ear, Nose and Throat disorders. In the beginning, this partnership thrived off of search engine optimization services (SEO) that we provided to help them increase traffic on their existing website. By March of 2016, even though their traffic was growing year over year, the Silverstein Institute (SI) was ready to take our partnership to the next level. After seeing Nextiny grow and develop into an Inbound Agency and HubSpot Gold Partner, they were ready to grow with us. They were prepared to start implementing further inbound marketing practices as displayed through this case study. Throughout the beginning stages of our partnership, SI was able to see the results of our efforts on a very surface level. They could see that traffic on their existing website was increasing after we implemented different SEO practices. However, this is where their analytical information stopped and their biggest challenge began. They were not able to measure online marketing efforts or understand which of these visits were converting into patients. Not only were they unable to determine how many visits to their websites converted through the Buyer’s Journey, they were also not offering any way for these visitors to convert through the website. They had a “Contact Us” page on the site, but it was both difficult to find and not enticing to complete, making its presence virtually useless. By not understanding how their current marketing efforts were working and the success they were creating for the company, they had no way of understanding which efforts were most successful and which were not effective practices for attracting their Buyer Personas (ideal customers). As we began to evaluate the challenges SI was facing, we saw them as a great fit for inbound marketing. 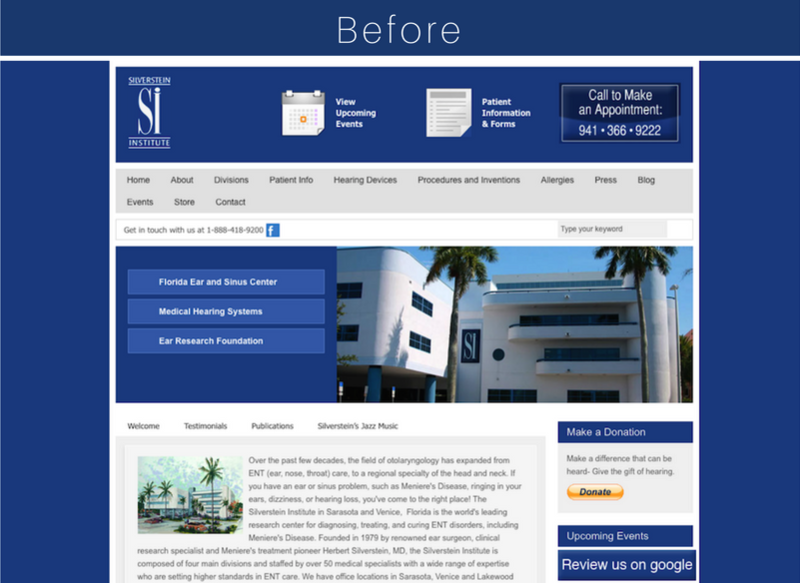 The first component of their marketing efforts’ overhaul, was to create a new responsive website, centralized around user experience. As a medical institute looking to convert patients through their website, we needed to make this as easy as possible for them. We created a responsive website with all of the institute’s services easily divided and navigable for all visitors, regardless of the type of device they use to visit the site. We also utilized HubSpot and Hotjar to analyze user experience and update the website on a month to month basis to increase conversions and ease of use. The old website focused on the institute and the doctors. It was very hard to use the menu and there was not a clear way to find useful information. There was also no easy way to contact SI or make an appointment online. The new responsive, Google and user-friendly website now has easy to use categories to drive people to the right place. The website is now properly focused on the patient and their issues, not the doctors. There are clear CTAs to convert visitors into leads and leads into customers at every stage of the Buyer's Journey. "There are clear CTAs to convert visitors into leads and leads into customers at every stage of the Buyer's Journey." The second largest component of our plan was to generate more visits, leads, and ultimately, customers using the website as an educational tool. As world-renowned leaders in ENT treatment, we needed to ensure that the SI website gave patients access to information on all topics related to the practice. While this information exists on web pages, it was also crucial to create in an internal blog. The blog page serves to educate website visitors on different ear, nose and throat related issues. This informative content also guides them to more specific offers like guides, in-depth podcasts, self-hearing evaluations, and more in order to help further inform visitors and aid them in their conversion process through the Buyer’s Journey. Traffic grew dramatically as a result of the combined development of Buyer Personas and the implementation of an inbound marketing strategy. The graph below shows traffic growing compared to last year’s, indicating an upward trend. Using Google Analytics to track historical website traffic growth. The creation of a higher quality website, focused on user experience, led to a dramatic increase in website traffic. 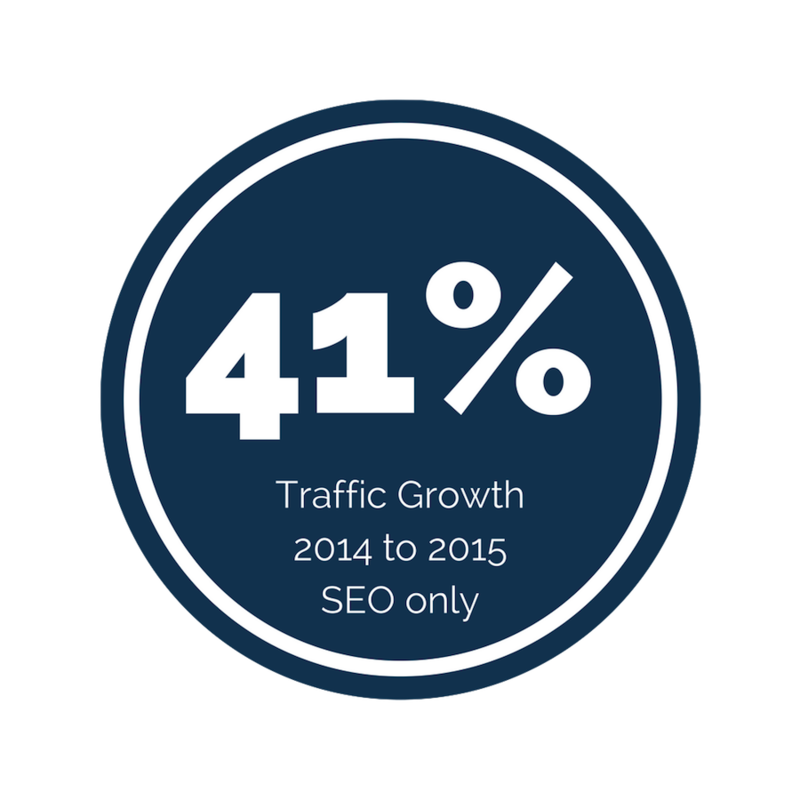 When analyzing website traffic, we saw that initially using SEO practices there was a 41% increase in overall traffic from 2014 to 2015. 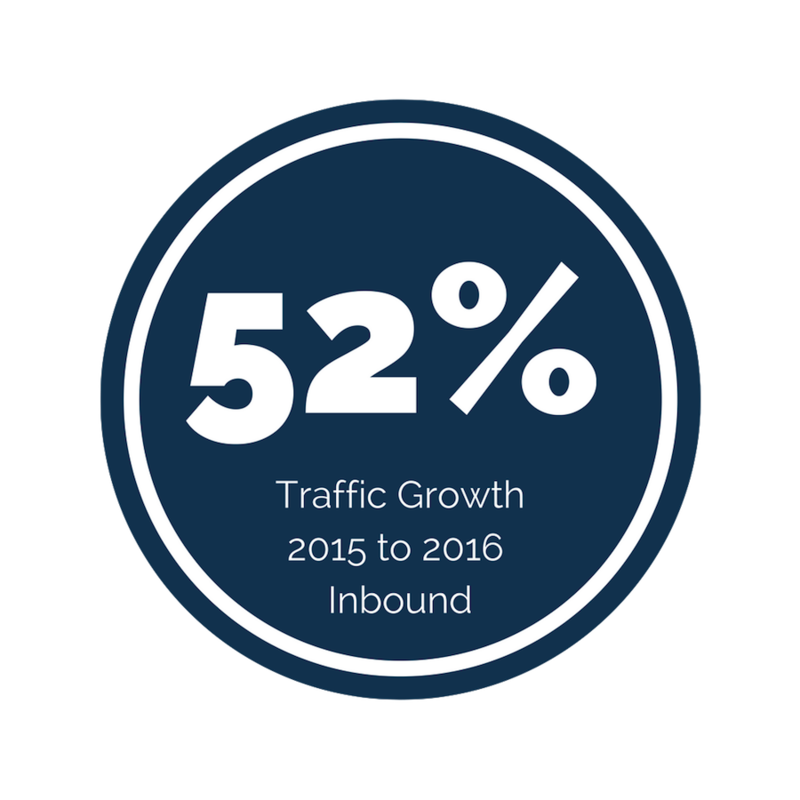 Then after inbound was implemented, growth increased even further to 52% from 2015 to 2016. Looking at the last 2 months though, we can see an even higher growth rate as traffic has doubled compared to last year. 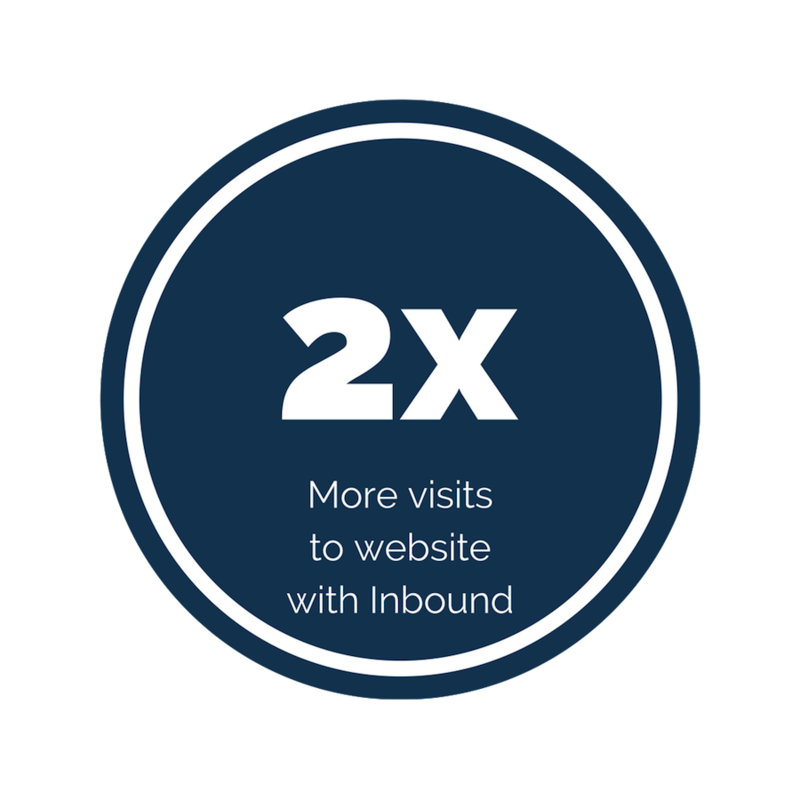 "In the past months of inbound we have seen traffic double compared to last year's numbers." While an increase in website traffic is progress, a more important measure of success is an increase in website conversions, from visitors to contacts. This aided conversion has proved to be very successful with the implementation of an inbound strategy. By creating better quality website traffic, we saw a 3000% increase in the conversion rate from visits to contacts. Measuring conversion rates with HubSpot to track growth from less than 1% to more than 7% (black line). To make all of this possible, we had to understand from SI who their ideal customers are. This information was gleaned through the development of content strategies that were then used to form all content offers present on the website pages, blog, and additional content offers. Once the new, responsive website went live in May 2016, SI was instantly able to view and measure Return on Investment (ROI). We began to slowly implement inbound marketing practices on their old website in March 2016 as the new site was being built. 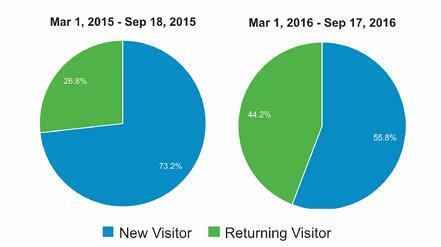 September 2016, these results were nearly split down the middle with 55.8% new visitors and 44.2% returning. With the increase in useful web content and high level user experience, people now see SI as an educational resource. They are now seen as authority that patients and potential patients want to return to. Six months into our inbound marketing partnership, we are able to see some outstanding results. From July to September we have measured 280% more leads converted for SI. This is 853 leads, compared to a previous 224. This has also led to an increase in closed customers of 338%. From those 853 leads, 758 became customers, compared to 173 who were converted previously. "The new website is converting organic leads 10x more than the old website." Organic leads generated with inbound marketing: Months 1, 2, and 3 with old website. Months 4, 5, and 6 with new site. One of the most significant results from this partnership is the proven ROI measured through HubSpot by closing the loop on reporting. After six months of inbound marketing, we have closed over 1,000 customers in HubSpot, SI has seen a 10% increase in patients this year which translates to a $3 million increase in revenue based on the lifetime value of a patient. $3 million increase in revenue compared to last year." We at the Silverstein Institute are grateful to Gabriel and his team at Nextiny Marketing for helping us take our website to the next level. We are now able to track our patients through the process from initial search to confirmed appointment. These tools have improved our marketing to the point that we have eliminated some of the print advertising on which we used to spend precious budget resources. And our physicians love that we can quantify results. Thank you Nextiny Marketing - you are a great business partner!